Vast and varied region, from the cliffs and beaches of the Mediterranean coast to the soaring mountains and river valleys of the interior. Large areas of Aragon remain wild and untouched. It is a region of contrasts, from the green valleys and snow-capped peaks of the Pyrenees to the dry plains and hills further south. Rugged coastline and mountainous interior, including the Cantabrian mountains and the famous Picos de Europa national park. with a high plateau between them. 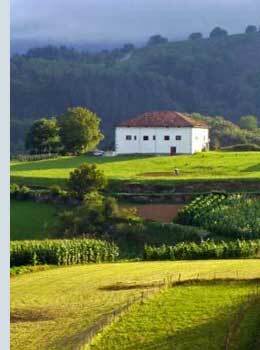 A coastal strip of low, wide and gently rolling valleys with a mountainous interior, including the Picos de Europa. An area rich in archeaological sites from pre-history. Popular archipelago of islands situated off the north-west coast of mainland Africa. Wonderful climate and highly individual landscapes. A dry, arid high plain surrounded by mountainous regions. The river Douro flows through the region. Vast central area of plains punctuated by mountains, notably the Montes de Toledo. Varied and proudly independent region, encompassing the Pyrenees and the French border, a rugged coastline and the wonderful city of Barcelona. Mountainous region bordering Portugal. An important area for wildlife. Green corner of the Iberian peninsula, with a beautiful coastline marked by inlets and archipelagos, and a gently mountainous interior, full of wonderful scenery. One of the smaller regions of Spain with miles of sandy beaches, rugged mountains, lakes and fertile plains. The heart of the country, containing not only the capital city but also a diverse landscape of mountains and plains. MurciaA mixed ladscape of hills and plains, marked by an abundance of castles and fortifications, showing the area's importance as a frontier between Christian Castile and Muslim Andalusia. Another region of stark contrasts, from the Pyrenees mountain range that dominates the territory to the plains of the Ebro river valley in the south. Small region famed for its wines. The landscape is mostly agricultural, with gentle hills and river valleys. The coastal strip is a fertile plain, which has been the site of much development over recent decades. But it also features areas of forested dunes and salt basins, attracting many seabirds. The interior is mountainous.